Some of the site’s content has a deceptively innocent quality. For example, clicking on the word “artist” on the home page leads to a page with the following text: “An artist? Yes. Here is a tip: I heard that the only way to become an artist is to say you are one. And then you can call “art” everything you make…. Easy, he?” Other sections are more grotesque (images of raw meat) or sexually suggestive (a tongue licking the screen). Many pages feature interactive Web forms, including multiple-choice questions that trigger delayed-reaction e-mails?days or weeks later, visitors receive unexpected, often flirtatious e-mails from Mouchette. There is also a listing of members of Mouchette’s international fan club, which includes art institutions around the world. 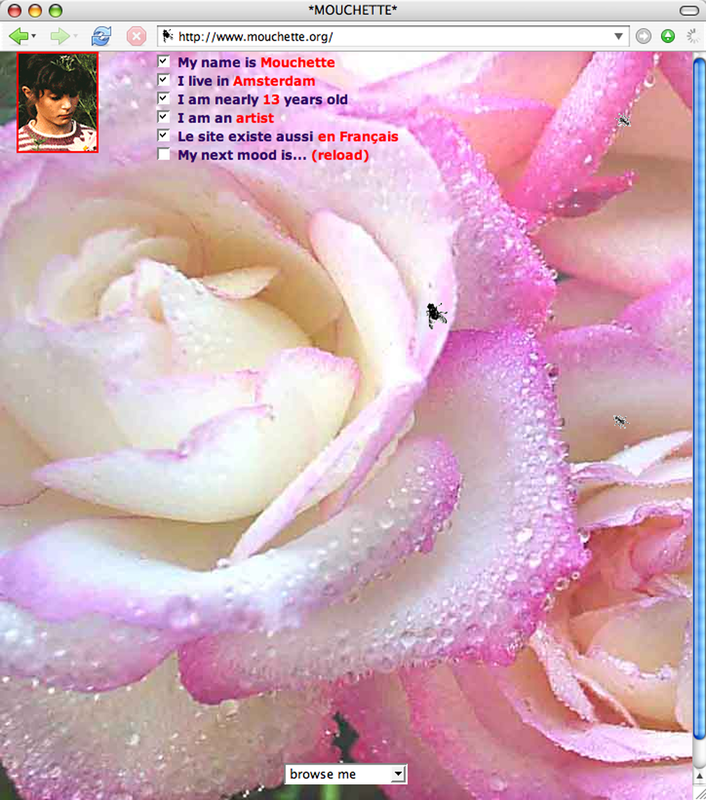 Could a Web site this sophisticated really be the work a 13-year-old girl? Who is the real Mouchette? The true identity of the artist behind http://mouchette.org remains unknown. The Mouchette persona and Web site are loosely based on Robert Bresson’s 1967 film, “Mouchette,” about a suicidal adolescent girl who is raped in a forest at night. A quiz likening the site to the film once appeared online, but after Bresson’s widow threatened to take legal action against the artist behind the project, the quiz was taken offline. It has since appeared on one of many Web sites created in response to the project. These range from celebratory spin-offs to angry attacks. Clearly, http://mouchette.org provokes heated reactions to its portrayal of child sexuality and to the way it constructs and manipulates identity online.http://mouchette.org’s use of feminine disguise can be likened to Cindy Sherman’s Untitled Film Stills, in which Sherman posed in photographic self-portraits as archetypal Hollywood heroines. But whereas Sherman’s work explores the performative nature of identity through portraiture, Mouchette does so through the sometimes playful, sometimes provocative interactions she sets up with her visitors.